In the women's division, Boom Generals proved just too much for the Balleros to handle as Boom Generals capitalised on their rivals' lack of ball handlers. Boom Generals employed the full court press right from the world go and forced turnovers. It was the fine shooting of Tara Mitic and the leadership of Pamela Barrozo which enabled them to lead comfortably the game. In the end, Boom Generals won with a huge margin 77-12 with Pamela Barrozo leading the way with 21 points. 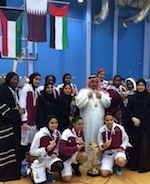 The Fifth GCC Women's Games got underway yesterday with a high-spirited opening ceremony in Doha. Fencing team member Maram Mohammed was the Bahrain flag barrier at the spectacular ceremony held at the Khalifa Tennis and Squash Complex. The 11-day event brings more than 890 athletes representing Bahrain, Oman, the UAE and the host country, Qatar, competing in 10 different sports championships. They are basketball, handball, table tennis, volleyball, chess, athletics, archery, fencing, taekwondo and bowling. Last night's ceremony was held under the patronage of Vice Chairperson and CEO of Qatar Foundation for Education, Science and Community Development HE Sheikha Hind bint Hamad Al Thani. Bahrain, who are taking part in all events except for chess, will be looking to complete a hat-trick having won the 2013 and 2015 Games held in Bahrain and Oman, respectively. Kuwait hosted the first edition Games in 2008, while the second was held in Abu Dhabi in 2011. However, their dreams received a setback yesterday after a 11-25 defeat to hosts and defending champions Qatar in the handball championship at Aspire Dome. Bahrain play their second match today when they face Oman, who lost their opener to the UAE 11-23 earlier yesterday. Other venues hosting this edition games are the Ladies Club in Aspire Zone, the Equestrian Federation, and Lusail Shooting Circuit, Qatar Sports Club, Qatar Bowling Center, and Qatar Chess Association. The volleyball team will kick-start their campaign today when they face highly-favoured the UAE at 4.30pm at Aspire Zone. The team completed their preparations under national coach Yasine Al Meel and his assistant Younes Al Haddar. Fencing events also start today with the flores and epee group contests taking place at Aspire Zone from 10am onwards. QLC Qatars Ladies Club () added to their roster 27-year old Puerto Rican ex-international center Angelica Bermudez (185-89, college: Kean, agency: Gamble Sports Management). She is a dual citizen owning also American passport. Bermudez played last summer at Manatee in Puerto Rican BSNF. In 20 games she had 2.9ppg and 3.9rpg. She helped them to end the regular season as a second best team in the league. They also advanced to the league semifinals. A very spectacular season in her career as she was named to Puerto Rican BSNF All-Star Game. The list of the past achievements is quite long as among others Bermudez won Puerto Rican BSNF championship title in 2013. She was also voted Latinbasket.com Puerto Rican BSNF All-Defensive Team in 2014. Bermudez represented Puerto Rico at the FIBA Americas in Edmonton (Canada) last year. Her stats at that event were 5 games: 2.8ppg, 5.0rpg. Bermudez has played previously professionally in Puerto Rico (Leonas and Athleticas) and Egypt (Al Ahly). She attended Kean University until 2011 and it will be her fifth season as a professional player.